If your idea of a romantic getaway in Arkansas involves rods and reels, you need to make your way to Hot Springs this summer! 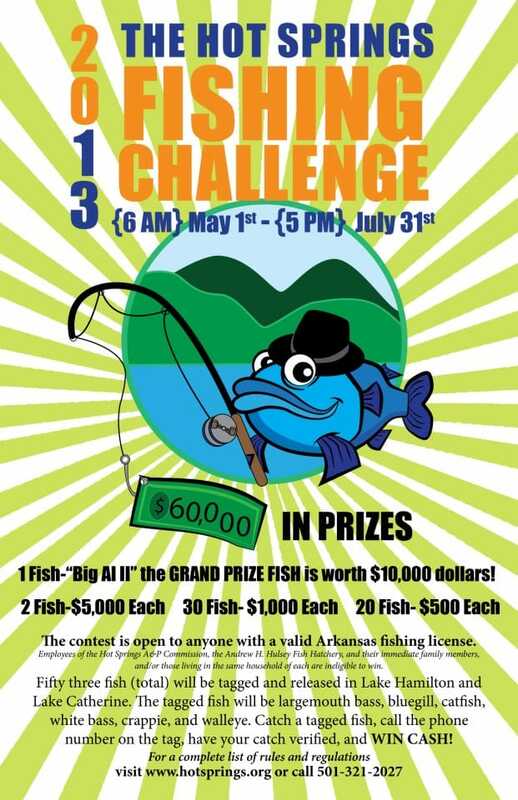 The 2013 Hot Springs Fishing Challenge started May 1 and runs through 5pm on July 31. Anglers are challenged to bring in tagged fish that can be redeemed for 53 different cash prizes. The tagged fish have been released in Lake Hamilton and Lake Catherine in Hot Springs. 20 fish are worth $500 each, 30 will catch you $1000, 2 have been tagged with $5000 each, and the grand prize, “Big Al II” will award the lucky angler $10,000! Last year’s top prize, Big Al, proved to be too elusive for anyone to find. Four fish have already been caught in this year’s challenge – so don’t waste any time! Grab your fishing gear & get to Hot Springs! Anglers will find Tiffany’s Bed and Breakfast strategically located between Lakes Hamilton and Catherine in Hot Springs, and DeGray Lake in Bismarck. We are also about 45 minutes from Lake Ouachita. We have ample parking for boats and trailers, and can even pack a “to-go” breakfast for anyone who wants to hit the water early. Don’t have your own boat? You could if you catch Big Al II! !